A major problem in phylogenetic or phylogenomic studies is that they might be hampered by signal stemming from other process than the descent-with-modification process. Therefore, we are developing new methods to ameliorate the impact of scuh processes in phylogenetic reconstructions. Processes such as lateral gene transfer, incomplete lineage sorting, compositional biases, mutational saturation or increased substitution rates, but also wrong assignment of a paralog to a ortholog group, so that the gene tree is inferred instead of the species, introduce artificial signal into the phylogenetic reconstruction and thus conceal the phylogenetic signal present in the dataset. Therefore, we develop new methods to determine the incongruence between different data (e.g., genes, but also morphological data) as well as some of their possible sources such as saturation, compositional biases or increased substitution rates more precisely. One such method is the PABA approach, which assesses the congruence between partitions on a node-by-node manner rather than an all or nothing approach. In another we developed the program TreSpEx, which exploits the information present in the tree reconstruction of single gene analyses of phylogenomic datasets to detect potential paralogs or contaminations in the dataset, conduct PABA analyses in an automatic manner as well as to determine long branch and saturation indices for each taxon within the individual partition of a phylogenomic dataset. Implementations in the program are automatic BLAST searches of affected potentially paralogous sequences against selected NCBI databases to assess if a paralog was detected. With a colleague at the museum we developed the program BaCoCa, which caclulates different sequence parameters for phylogenomic datasets. We bring these methods to bear on potential Long Branch problems such as might be the case with Platyzoa. The taxa grouping together as Platyzoa are characterized by strongly increased substitutions rates in molecular-phylogenetic or phylogenomic studies. However, such long-branched taxa have a tendency to artificially group together and, thus, it is uncertain if Platyzoa is a real monophyletic taxon with an overall increased substitution rate. 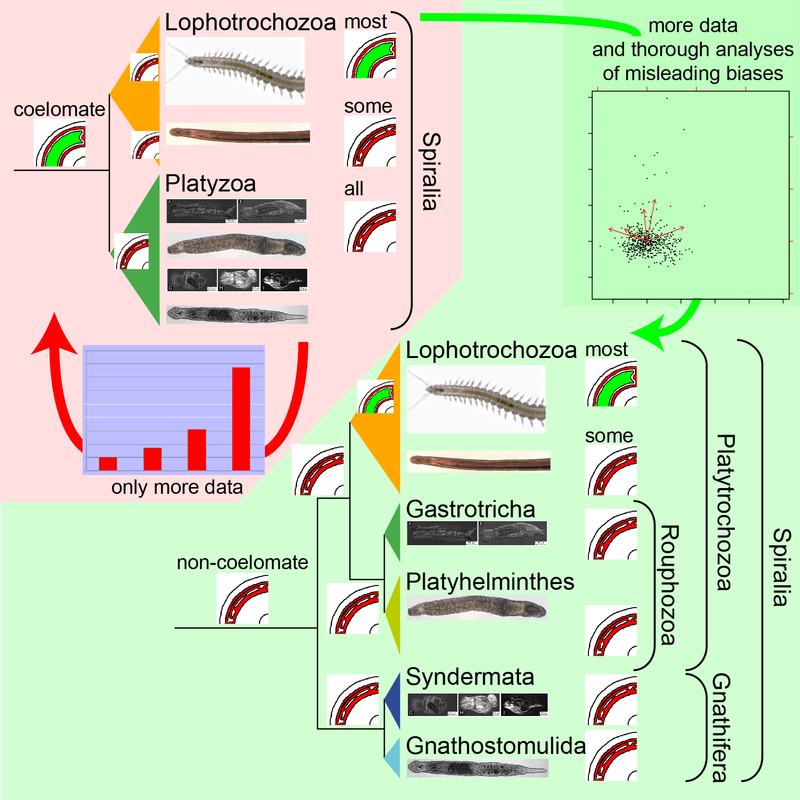 Therefore, detection of such problems in crucial to reveal the phylogenetic signal regarding platyzoan taxa. In recent study we could convincingly show that indeed support for the monophyly of Platyzoa stemmed from artifical rather than real signal. 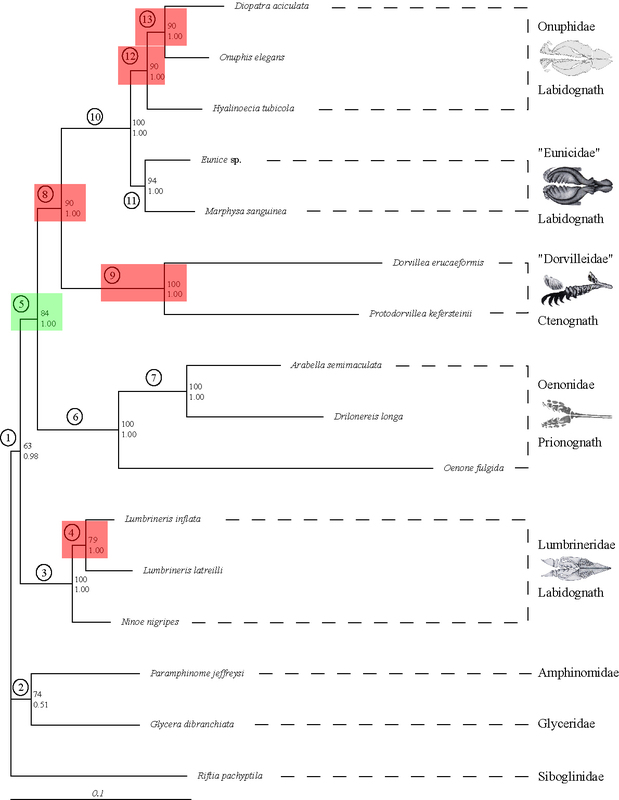 Phylogeny of Eunicida using four different genes. Taxa with ctenognath jaws were previously thought to be basal. Red boxes indicate nodes with conflicting signal by PABA (see Table 1 above). This tree is from Struck et al. (2006). The influence of different strategies to analyze the data. Only using more data was not able to overwhelm the artificial signal for the monophyly of Platyzoa. Only employing sophisticated methods allowed the detection and amelioration of misleading signal resulting in the paraphyly of Platyzoa. See Struck et al. (2014).